Prince's Hot Chicken - The original home of the hot fried chicken (pictured above). The chicken is marinated in a spicy paste and coated with hot sauce. Don't come here expecting any ambience but the hot chicken lives up to the hype. Start off with the medium spice level because the heat creeps and builds up. The half chicken is definitely the juiciest but the tenders are good when you're feeling lazy. Order a side of pickles, ranch (necessary for hot chicken even though it comes in a packet), and buttered toast. 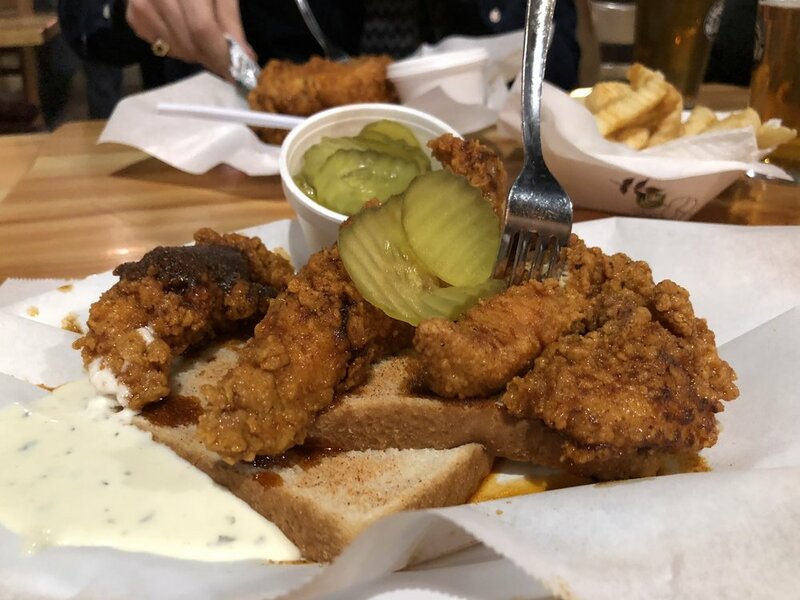 Hattie B's - A more recent but very respectable addition to Nashville's hot chicken scene. The breading crumb for the hot chicken is finer and more delicate than Prince's. The medium here is barely spicy. Inside tip, order ahead online for pick-up and skip the line. Martin's Bar-b-que - The sides are equally important to us as the meat and Martin's does a great job on the sides. We especially love the broccoli salad and corn hoecake. Chicken isn't a normal order for us at bbq joints but the smoked chicken here is very juicy and tender. Jack's Bar-b-que - You will find yourself on Broadway and Jack's is in the middle of the strip. The brisket here is melt-in-your-mouth and the meat is the star of the show. Peg Leg Porker - a bbq institution loved by locals. Rolf and Daughters - Order the pastas! The garganelli is our favorite. Cafe Roze - Very cute and bright space for brunch. The yeasted waffles are a must. Pinewood Social - Great for group dinners. The drinks are maybe too quaffable and you should definitely go bowling here. Make sure you put your name down ahead since there's only 4 lanes. Little Octopus - This gorgeous pink little restaurant has great tapas-sized dishes when you need something healthier and lighter. 404 Kitchen - Impressive whiskey collection. Tootsie's - Great music with an outdoor space on the top level. Honky Tonk - The bands here have never disappointed. Barry's Bootcamp - Pack workout clothes. You'll want a sweat in the middle of your meat-sweats eating marathon. Nisolo - Reasonably priced leather shoes for women and men. White's Mercantile - Cute home goods store.